MixVibes team has released a video Plug In for Cross and CrossDJ 2.2.0 to mix video files. This video plugin needs Cross or CrossDJ, to mix most type of video files whose codec is installed on the computer (.mov, .mp4, .avi, .mpg, .mpeg, .m4v, .mkv, .vob, .flv, .divx, .webm, .wmv). so with MixVibes video plugin + Cross, you can mix video with all current DJ controllers from Hercules. 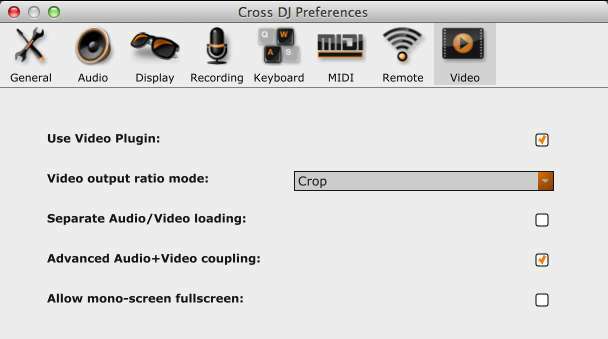 Mixvibes video plug in for Cross DJ is sold for € 129 (VAT included) and operates both in Windows and in Mac OS. Hercules wishes you a very merry Christmas, and a great new year in 2013! Today, we introduce the Hercules DJConsole RMX2 "It's Your Turn" doc-series with this first video featuring the young DJ: DJ Dr Faust! This short interview series follows DJs from across the world on their journey to follow their passion and how they use the DJConsole RMX 2 as the tool for their dreams. November 23: the 2nd video is now online and features another young artist: DJ Elektrocute! November 27: Watch the 3rd video where DJ Mnyce talks about his history and what part of RMX2 he prefers! November 29: A 4th video is now online, and this time, it gives the floor to DJ SI, a younf DJ from New York (USA)! A New Hercules DJConsole RMX2 Facebook Quiz Contest Has Started! This time, there are 3 Hercules RMX2 DJ packs to win, including a unique and customized RMX2 and a black RMX2! Answer the question to enter, and let your friends know about the contest too: the more of your friends who participate using your invitation requests sent via the "Invite Friends" button, the more chances you'll have to win! The winners will be randomly selected from among all of the correct answers received. Good luck and do not forget to share to your friends to get more chances to win! We've released a new MAC OS X driver package for DJ Console Series: Version 4.45! 1- Click the link below to download the new driver for your Hercules DJ product. 2- Once the download is complete, double-click the installation file and follow its instructions to install the new driver. New York - September 27, 2012- Hercules, the leader in mobile DJ controllers for PC/Mac® and computer audio expert, is proud to announce its latest model headphones, the HDP DJ-Adv G401. The new stylish and comfortable model, designed for amateur DJs, completes the line of headphones unveiled by Hercules last Christmas. The HDP DJ-Adv G401 headphones feature all of the ingredients required to meet the demands of DJs and music enthusiasts, including perfect audio fidelity, pleasant and powerful sound, flawless sound insulation and comfort. Stylish and trendy, the HDP DJ-Adv G401 headphones feature a mechanical design very similar to Hercules’ professional models, the HDP DJ-Pro M1001 and the HDP DJ-Adv G501. The HDP DJ-Adv G401 circumaural closed-back headphones’ silhouette traces a continuous curve from one earpiece to the other, avoiding pressure on the user’s head, while at the same time perfectly shielding the DJ from external sounds. Suited for both large and smaller heads, the headphones cause no strain, even during prolonged use. The earpieces rotate around three axes, enabling DJs to preview their mix with one ear or fold the headphones away for convenient storage and transport. Also designed for previewing and mixing, the HDP DJ-Adv G401 offers a frequency response ranging from 15 Hz to 22 kHz - an audio spectrum wide enough to gauge tracks precisely and hone last-second settings before airing the music to the audience. The 50 mm diameter drivers produce clear sounds, with precise and deep bass, making them not only ideal for analyzing rhythms, but also for simply enjoying music. Their low impedance (32 ohms) and high sensitivity (100 dB @ 1 mW) ensure powerful sound levels, enabling DJs to listen to tracks even in the loudest environments - for instance, next to PA system speakers. The Hercules HDP DJ-Adv G401 will be available late October 2012, at a suggested retail price of $79.99. The Hercules DJConsole RMX2 World Tour Full Schedule! The Hercules DJConsole RMX2 World Tour has started and will soon land in your country! Please note that dates for events to be held in Marseille (France), Berlin (Germany), Moscow (Russia) and Miami (USA) are also being confirmed. For more information about those events, but also photos and videos of this World Tour, check out the Hercules DJ Mix Room Facebook page! - A DJ Control Air. 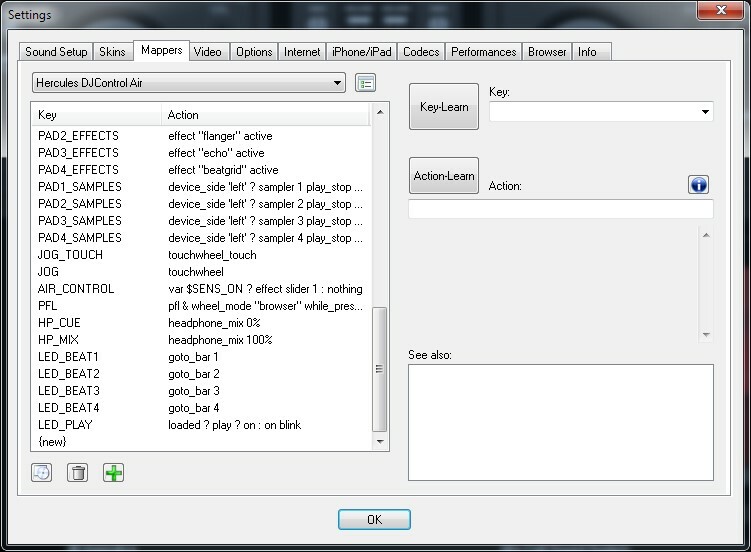 3) Run VirtualDJ Pro 7.
a) Check the map is activated. 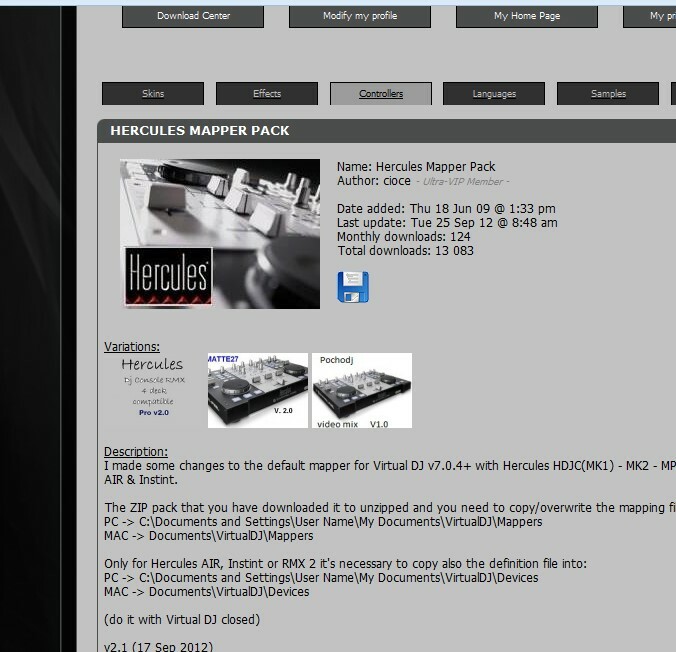 Go in Config > Mappers and make sure Hercules DJ Control Air is selected. b) Go to the Sound Setup tab. 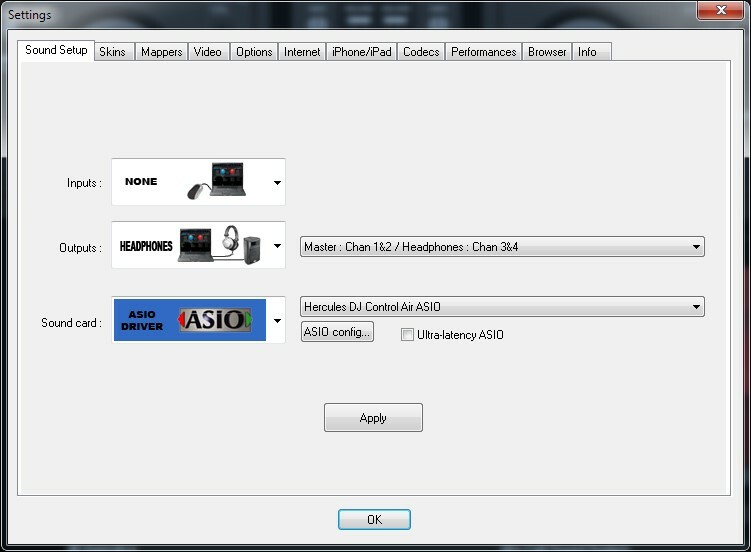 - Sound Card = ASIO drivers, and select "Hercules DJ Control Air ASIO"
You can now mix with Hercules DJ Control Air in VirtualDJ Pro 7. The cake is a RMX2! To celebrate the launch of the RMX2 and the RMX 2 Quiz Contest on Facebook, one of our Facebook fans made a special cake! Look at it, what an artist he is! Many thanks to him! One question, 3 RMX 2 TO WIN! Enter the RMX 2 Quiz Contest on Facebook! We launched a Hercules DJConsole RMX 2 Quiz Contest on Facebook! Answer to the question (a very easy one) and get a chance TO WIN one of 3 RMX 2! The quiz contest is now opened and will end on the September 30 at 11:59pm. The 3 winners will be drawn among the right answers.